William Miller is a self-contained Oliver in a production so realistic you can practicially smell it. Now here's a twist. Most short or medium-length adaptations of Oliver Twist save time by condensing or eliminating the subplots to focus on Oliver's own pathetic progress. The 2007 Oliver Twist, adapted for three hours of television time, actually directs greater attention to the background characters and stories, refashioning them in the process. And it really works. It may not be as Dickens wrote it, but it may be as Dickens would write it if he could organize Oliver Twist all together, rather than in instalments spread over two years, tacking on segments as they came up. Oliver's inheritance, the intrigues of Mr. Monks, and Mr. Monks's relationship with the Brownlow family are woven into the main plot more directly. More excitingly, the intrigues among Fagin, Sikes, Nancy and the Artful Dodger are developed realistically and with great attention to each character's personality and inner conflicts. Plus the Bumbles get their due for once in a movie, without seeming to be there as mere plot devices. The master of this holistic rewriting of Dickens is Sarah Phelps, best known as a writer for British episodic television (The East Enders). The director pulling it together so naturally is one Coky Giedroyk, also known for her classic adaptations on TV. Exciting British (for the most part) actors bring new dimensions to the characters too. 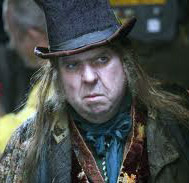 Fagin in the hands of Timothy Spall is now more of a den mother to the young gang, a fat and effeminate old rascal, torn between his devotion to the lads and his sense of self-preservation. At first he seems too different from previous Fagins, and from Dickens's description, but he makes the role his own, taking it in an interesting—perhaps more sordid and credible—direction. No such contradiction is found in Bill Sikes, played chillingly and powerfully by Tom Hardy as a modern psychopath without a shred of humanity in those dark, dark eyes. What childhood traumas made him that way, the performance forces us to ask. And there's Nancy—the facilitator, the abused and conscience-stricken mate, who stands by Sikes because, despite all evidence to the contrary, she thinks that deep down he's really not that bad, and who pays dearly for her love. It may be historically inaccurate to cast black actor Sophie Okonedo in the role, but Okonedo becomes the most memorable Nancy of them all, a truly brilliant and heart-rending performance. Even the usually bland roles of Mr. Brownlow and his ward Rose are heightened in this retelling. Venerable British standby Edward Fox turns in one of his most varied performances as the gentleman who is kind, suspicious, naive and hardened all at once. And then there's the Dodger—a major character in the novel who becomes comic relief in most film treatments. But here the young thief (newcomer Adam Arnold) is revealed as having a crush on Nancy, being jealous of the attention given Oliver by her and Fagin, resenting the implication that the boy may be more than "nuthin', like the rest of us", and feeling guilt for his part in bringing down those he loves. Almost forgot Oliver. Isn't that telling? But it's no fault of eleven-year-old William Miller. It's to his credit really. His self-contained Oliver, far from some of the cutesy or too precious-for-words Olivers of the past, allows the story and the figures around him to shine . A word should also be said about the look of this presentation. The grey and brown tones of the film help make early nineteenth-century London as grim and grimy as it must have been for the lower classes. There's nothing Hollywood about the miserable appearance of the people—you practically smell their clothes and you avert your eyes from their bad teeth, running sores and lack of personal hygiene. Not a film to be dining before. This is an involving adaptation that doesn't rely on following the Oliver Twist formula but forges a new, fulfilling vision of the classic tale.